One of our resident forum members, Crazyfreak, recently fully translated and posted a full interview from back in October 2004 concerning the The Legend of Zelda Manga. 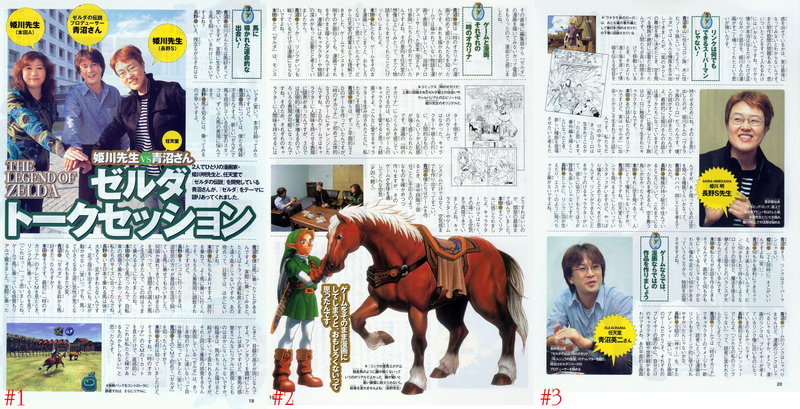 In particular the interview discusses some interesting topics concerning the connection between the Zelda Manga and the actual Zelda Games. Here is a quick tid-bit, but be sure to click read more to see the whole thing. Special thanks to Crazyfreak for the translation. For those of you that are frequent visitors here at the site, you might recognize Crazyfreak as she is a very talented artist who has gotten several of her pieces featured here at the site. You can check out her North Castle Account where you can find quite a few amazing pieces of Zelda artwork. Be sure to click read more to check out the full translation. You can also view the original scan of the interview by clicking here. We had the honor of meeting the producer of the latest “The Legend of Zelda: Twilight Princess” on Wii as well as two members of the studio Akira Himekawa. Together, they shared their passion for this series. Eiji Aonuma: I heard that Akira Himekawa studio, you love to ride a horse. Do not tell me that you raised one yourself? Nagano: No, even if it is too bad (laughs). If I could have the opportunity, I would dream to be able to take care of horses. Eiji Aonuma: I must admit that Nintendo, we do not know much about horsemanship. But when it came to perform and lead a horse to the Zelda series, the whole team was very tired of it. Nagano: To become familiar with them, there’s nothing like then to ride on your own. Eiji Aonuma: Yes, I agree with that. And you know what; it gave me a strange feeling because of the size of the horse. It’s like when you go up the first time in a truck. We see the world passes by at a height which is not usual. There is nothing comparable at the height of a saddle horse in our lives. Riding allows us to have a truly original vision of the world around us. Honda: We also, whenever we travel somewhere we manage to always find time to practice just the riding. Of course we are going to places where animals are trained for this, they are not wild. Nagano: Some time ago, we had the chance to spend a few days in Mongolia. We spent a week with the nomads and they allowed us to choose the frame that we prefer. For one week, we traveled on their backs and this fantastic experience really helped me to better know them and tame them. Honda: Mine was very small, so that my vision was substantially the same as in a big car.In any case, it was my size and it felt good turn. Nagano: The horses that we can go to Japan are all huge, but not necessarily very agile. And compared to those we had in Mongolia, they are a little hard of hearing and do not really listen when you ask them to go in one direction (laughter). Small specimens, however, are more reactive. Well, it also happens to be more impulsive and it brings its share of surprises. Eiji Aonuma: You loved the horses before working on the Zelda series? Honda: Yes, absolutely. The first time I saw the TV ad for the game “The Legend of Zelda: Ocarina of Time,” which I saw Link riding a horse and I told myself that this game was definitely interested! Especially the feelings seemed so real for a game this time. The camera angle corresponded perfectly to the average height that was from a saddle. There are many games set in fantasy worlds, but none managed to match “Ocarina of Time” for immersion and enjoyment of galloping on his horse that he brings. Already, just by visionary design, animation and reactions of the animal, I am told that your team had a super good job. But taking the joystick in hand, I really realized that this episode it and the Zelda series were really fantastic in many respects. Eij Aonuma: Thanks to the publicity that you’ve discovered the ‘series? Honda: Actually, I knew the name Zelda. But it is actually seeing the claims of “Ocarina of Time” on TV I felt I may have missed something before. Shortly after, my editor gave us a phone call asking us if we were interested in adapting The Legend of Zelda manga. I thought it was a stroke of fate. Honda: Anyway, Zelda is not an action game where you simply cut out monsters! All characters have a history and a soul. Personally, I felt all the players so close to us! And so today, readers feel the ’emotions of characters through our pages, mainly because we also felt the love for these characters playing the game I must admit that we were amazed to see that we were able to create videogame characters that move us all! Honda: I’ve found it very realistic. I am not talking only of expressions on the faces of the characters but places and the atmosphere! Already to create such a game on a gaming system is particularly complicated, but it created an atmosphere, an universe that is fantasy! Eiji Aonuma: Normally, when we make a new game, we are regularly testing to see if the sensations are good in the game and if the universe is consistent. But in the case of the Zelda, we should wait until it is completed to see if eventually the atmosphere was that we wanted to give it. Especially since we are limited by development time and we can not introduce all the elements we want. In other words, the end result is not quite up to what we want to offer players. But quite honestly, I am delighted that you have just managed to fill those gaps with some of the manga adaptation. Eiji Aonuma: In Ocarina of Time, as in most Zelda, we have created a large number of tribes, like the Goron who live in the mountains or the Zoras, people from the water. For the episode “The Wind Waker”, when we chose to situate the action in the middle of the ocean, we immediately felt the need to create a race that can move through the air. During long trips offshore, we needed faster characters capable of transmitting information to Link. It was at that moment that I remembered Watatara clan, you had invented for the adaptation of “Ocarina of Time.” In short, I digress a bit about the initials but we are inspired by your work to give birth to Rito Race, creatures that are half-man half-bird that can move very quickly with their wings. Honda: In fact, we invented this passage to the needs of the manga. But these characters did never appear elsewhere in the world of Zelda. I think we would have been impossible to imagine all this without the great wealth of the series. When we made the decision to add this passage, we wanted to offer a new breed for the players. However, the only characteristic that we had was to fly. Aonuma: Ha ha ha! We have therefore followed the same reasoning! Nagano: Indeed, when we reflect on the particularities and details of their lives, only the birds had not yet played a major role in Zelda and only the sky was still uninhabited. Honda: And yet, flying is still one of men’s greatest dreams. Aonuma: Yes, quite. Even within our team, there were many who wanted Link to finally fly. But we preferred to leave that to the imagination of the player. We prefer to attribute other characteristics of the characters that Link does not possess. The interactions between different actors and their solidarity makes the adventure even more exciting, is not it? Nagano: Exactly. Provide a Link wings and let him fly freely does not match his personality or the universe of the series. Eiji Aonuma: That’s it! Link is anything but a superman capable of all the exploits! Aonuma: And then a large part of the fun would disappear if he had powers all the more useful one than the other. It is important to balance his abilities. On one side he has small bottles to put various things without really knowing what they serve him and the other, he has his disposal in various magical powers that are very powerful. It is the mix of all these elements which we take pleasure to play. Honda: We, too, when we create stories, we avoid giving our people what they need from the beginning. They need dreams, goals and desires. It was from there that build a story. Eiji Aonuma: In the video game, Link never speaks contrary to the manga. But I think the Link you offered players comes close to the image they have of him and his personality. I am very happy with that. Eiji Aonuma: I think the timing has significantly contributed to the favorable reception which was reserved for the manga. Indeed, it was released at the same time that of “Ocarina of Time” and as Link had just been rewarded with a brand new image for us, it allowed readers; to accept him very easily, Is not it? Nagano: “For the Volume” A Link to the Past ” the pressure was again very heavy to carry (laughs). Since the original game was in 2D, each of us has represented the universe in his or her own way. Admittedly, the universe and the protagonists were in 2D, but no doubt that gamers are represented them in relief. So we had all the trouble to explain our vision of the universe. It was not to betray the world of original game while trying to satisfy the greatest number. Eiji Aonuma: “In “A Link to the Past”, there is few text and character that speak. In addition, the story is also sufficiently vague to allow for embroidery around. I therefore assume that your readers expect from you that you give free rein to your imagination, right? Nagano: Frankly, we would be so happy if the creative Nintendo could learn from our manga to realize their games! To participate in the development of a Zelda, even indirectly, we would be mad with joy. Eiji Aonuma: Well I can tell you, you’re already a great help! I’ve seen guys in my team who for a little help from mental exertion were taking their break by reading manga Akira Himekawa (laughs)! You have a knack for telling wonderful stories to us that is very useful. I, for example, I love your adaptation of the title “Four Swords Adventures”. Yet, the content has so much more to do with then the original. In the original, four Link’s have the same expressions and the same reactions. Once they are passed in your hand, one will be impressed by how you came to give so many different personalities to each Link. You really did a good job on this subject, which is undeniable. The pages are yet in black and white but you can easily divide each Link by their given personality. Nagano: It is a peculiarity of the manga, yes. Finally in the absence of colours to facilitate reading, the characters must be more expressive. Honda: Manga, yes, it’s full of small codes that can do tons of things. Even in “Four Swords Adventures”, the four Links are similar, but slightly modified in certain features; it has managed to give unique expressions and very personalities. That is the little bit “magical” symbol of the manga universe. Eiji Aonuma: It’s just the same thing in video games. Normally, 3D offers many more possibilities. But should that mean we always prefer the 3D over 2D? I do not think like that, quite the opposite. The 2D possesses qualities and a charm that is not found necessarily in 3D. Both styles have their qualities and their defects, and it is sometimes choose one or the other depending on what you want to express. Honda: Indeed, Mr. Aonuma, I have a question. Are you sensitive to the ways when you make a game?